The Vista Collection is upholstered in a 100% polyester material created to give the look and hand of leather. 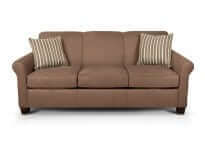 This roomy, comfortable group also offers optional power recline and USB port for the sofa and loveseat. The Vista offers the latest innovation, Ultralign Recline Technology. This technology combines features to form what we like to call the “Sweet Spot” that cradles the body, reducing pressure points while providing a deeper more stable, COMFORTABLE seating experience. We also moved our reclining mechanisms to allow for deep seating. You’ll sit IN our furniture, not ON it. . Proudly made in the USA!